This beaded bail uses the principles of some of my Geometric Series of beadwork to create an easy to bead, versatile bail. This complete 4-page step-by-step tutorial contains all the instructions, diagrams and photos you will need to make your own version of the bail. 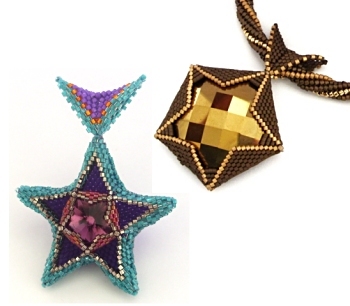 Please note that these instructions do not contain details on how to bead my Geometric Crystal Stars or Geometric 1-9-1 instructions. Both of these instructions are available separately and already include instructions on beading the bails.